It is no news that Tanzania is home to one of the most ecologically significant National Park in Africa, and the world arguably. In fact, the wilds of Serengeti National Park can aptly be described as nature showing off her beauty, power, and awe. The park is a vast natural reserve and the most widely populated animal reserve in Africa, thus, making it the best place for game viewing. The word, “Serengeti” is derived from “Siringit” a Masai word, which means “endless plains”. In other words, this describes the massive flat grassland that covers a large percentage of the park. Situated between the Mara and Simiyu regions, the Serengeti National Park is Tanzania’s oldest and most famous National Park. With a land size that covers 5700 sq miles of grassland plains, savannah, riverine forest, and woodlands, the park is bordered by Ngorongoro Conservation Area, Loliondo Game Controlled Area, and Grumeti Reserve. 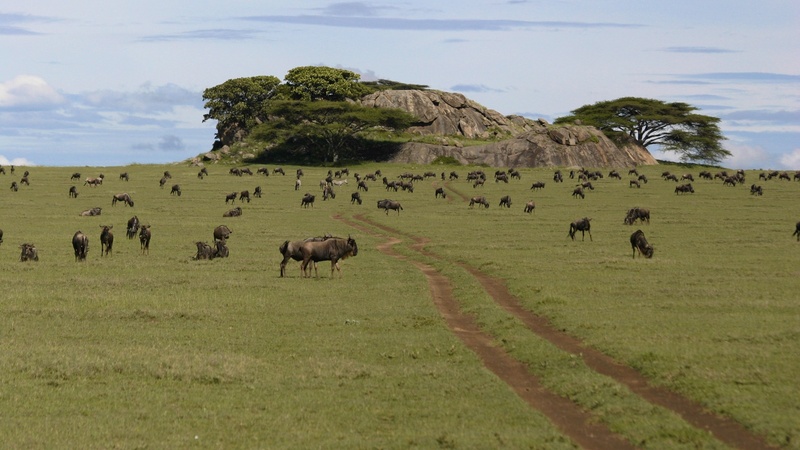 The park is divided into three regions – Serengeti plains, western corridor, and Northern Serengeti. With several tented camps and lodges nestled in the park, the area is the perfect place for a memorable holiday with lots of exciting activities including solid game-viewing. There are also luxury and majestic-style villas and lodges in the park. Thus, finding a place to stay in the Serengeti is easy with so many options to suit your budget and satisfy your needs. These camps include Ang’ata Serengeti camp, Grumeti migration camp, Kati Kati tented camp, Kirurumu Serengeti mobile camp, Lamai camp, Serengeti Safari camp and Sayari camp. The tented camps usually consist of a canvas tent, pools, lounge, and dining tent with the ensuite bathroom having showers, vanity desks and flush toilets. 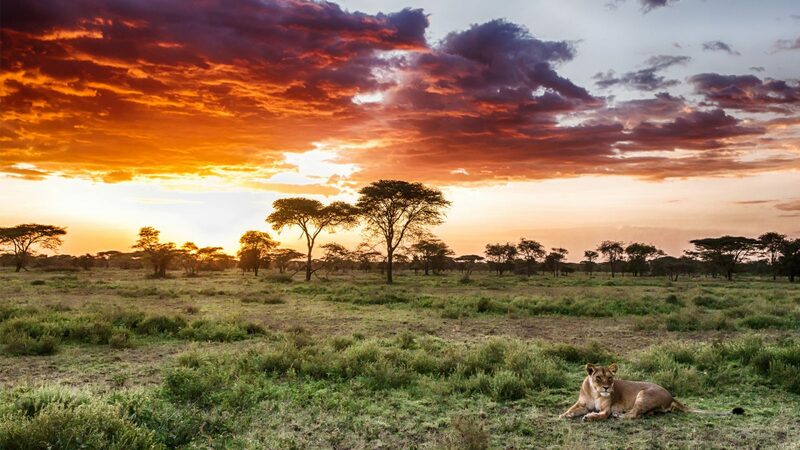 Listed by UNESCO as a World Heritage Site due to its biodiversity and ecological significance, the Serengeti National Park is home to a wide species of animals and plant life. The Serengeti National Park ecosystem has been named the oldest on the planet as it boasts a diversity of plants and animals that are unavailable anywhere else on the globe. The park is inhabited by lions, leopards, cheetahs, bush elephants, black rhinoceros, buffalos, giraffes, spotted and striped hyenas, jackals, golden wolves, honey badgers, mongooses, otters, wild dogs, monkeys, aardvarks, porcupines, zebras, gazelles, hippos, antelopes, baboons, ostriches, warthogs, close to 500 species of birds amongst many other wild animals. This collection of animals, on its own, is truly an amazing wonder. The park is a vast expanse of serene grasslands and forests. You can’t miss the diverse set of landscapes in the reserve which includes riverine vegetation, soda lakes, acacia forests, swamps and rocky outcrops. 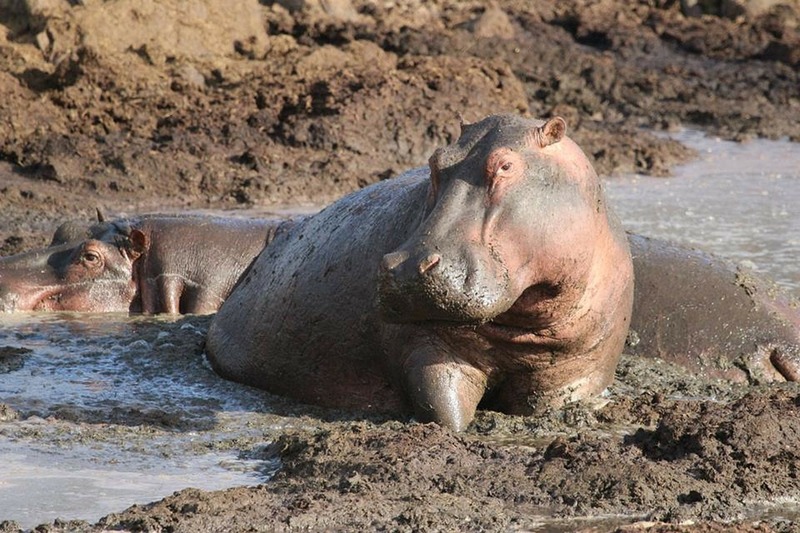 You’ll find the hippos basking lazily in the tropical swamps under the shades of the wild Date Palm – native palm trees. Leopards are usually found under the African Acacia trees during the daytime. The elephants are seen around the sizable rocky outcrops and you’ll see a group of lionesses hunting for preys to kill in the open. Tagged the ‘World Cup of Wildlife’, the Serengeti migration is considered one of the ‘Seven New Wonders of the World’, a truly natural wonder and a must-see for every ‘safarist’ visiting Tanzania. 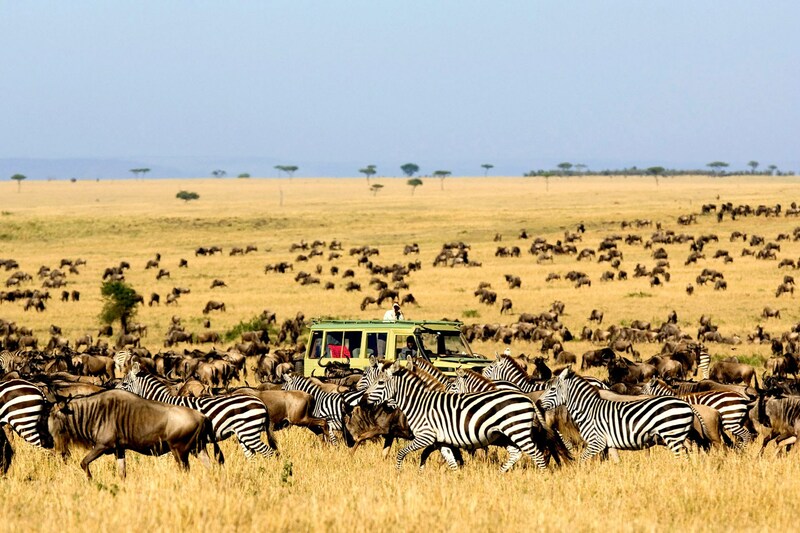 Unlike many other national parks in the world, the Great Migration of wildlife between the Maasai Mara Game Reserve and Serengeti National Park makes the reserve a unique one. 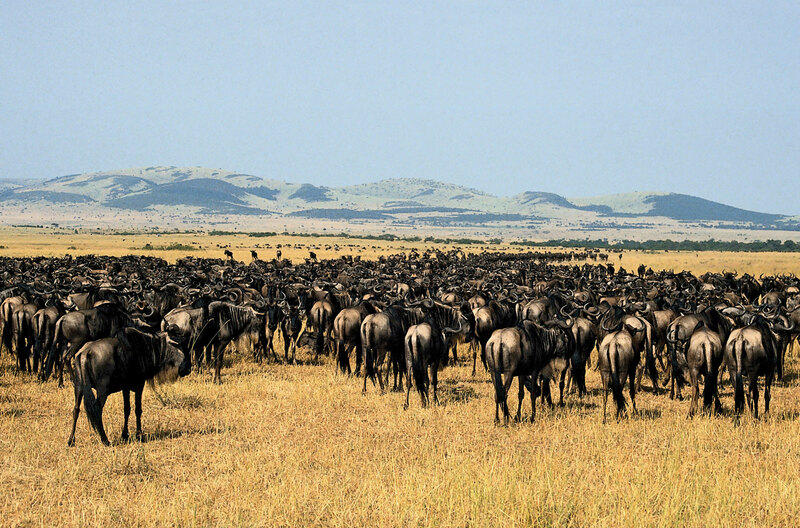 The extremely weather-dependent migration is an annual event that sees a great march of over 1.5 million wildebeest, 250,000 zebras and a host of other antelopes travel a distance of 800 km or more in search of food and water between Tanzania and Kenya. You can explore the wilds of the Serengeti National Park throughout the year. However, there are some areas you can visit at some specific times. You can visit the park during the Dry season, which is from late June to October. This is the best time to go game viewing with the Great Wildebeest migration as the major highlight. The Wet Season is between November and May. This is the best time to the wildebeest calving in the southern part of the park. Getting to Serengeti is a doddle, whether you’re visiting for a week or two weeks. Direct flights depart frequently to various airstrips in the park including Seronera and Kogatende from Arusha Airport, Mwanza Airport, and Kilimanjaro International Airport. 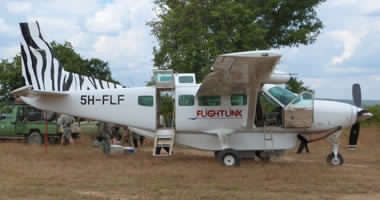 Get the best affordable flight deals with Flightlink for your trip to Serengeti National Park. You will save a lot and have extra cash in your wallet, which may come handy when shopping for souvenirs in Arusha. 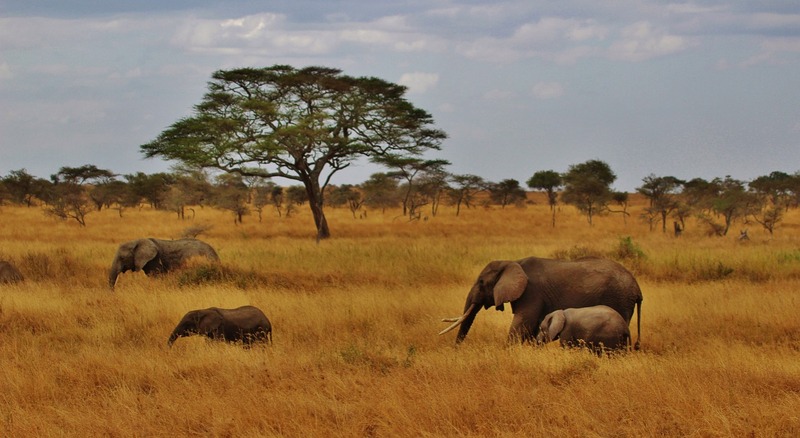 A safari in the wilds of Serengeti National Park will give you a chance to explore its surrounding areas. It’s an experience you won’t want to forget in a hurry.